The earth’s axis is tilted about 23.5 degrees, so the Earth is never straight up and down compared to the Sun. When it is summer in Northern Hemisphere, that is because the North Pole and the rest of the Northern Hemisphere are pointing toward the Sun. The Sun appears to stay in the sky longer each day (really, we are just pointed toward the Sun for longer each day). Because we spend more time in the sunshine and less in the shadow of night, our part of the Earth gets warmer, and we experience summer. During the summer, the Sun is high in the sky. Therefore, rays of light from the Sun hit us more directly during summer, making the sunlight more intense and warmer. In winter, the Sun is low in the sky. The rays of light are spread more thinly, and they do not warm us as much. 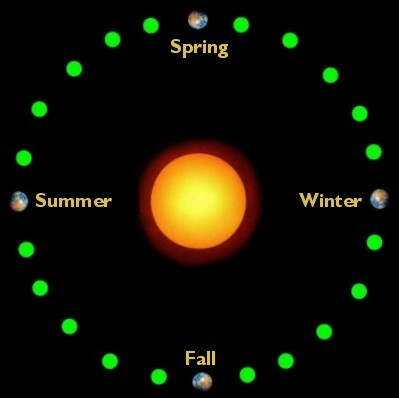 In Winter, the Northern Hemisphere points away from the Sun. It spends more time in darkness (has longer nights) and the sun’s rays are not as concentrated. In Spring and Fall, the days are nearly equal in length for both the Northern and Southern Hemispheres. 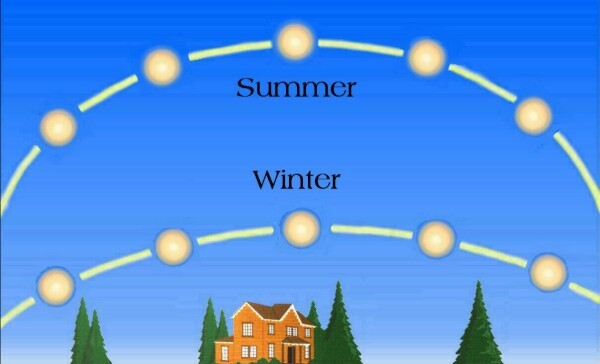 In Summer, the Northern Hemisphere spends more time pointed toward the Sun, and the sun’s rays are more concentrated and warmer. Throughout the seasons, Earth is almost the same distance from the Sun: 93 million miles. It is closest to the Sun on about January 3rd (the middle of our winter!) and farthest from the Sun on about July 3. Don’t be confused by the perspective of these drawings: the Earth is really going around in a nearly perfect circle, and it is MUCH smaller than the Sun. The drawings above look at the Earth from the side, and the drawing below looks down on the North Pole.